External USB Interface - External USB with built-in charging cable offers convenient charging of your USB enabled electronic devices whether on a business or leisure trip. Dimensions:18 x 11.5 x 6.5 inch Travel laptop backpack applies to computers up to 17 inches Large Capacity: This backpack has multiple storage compartments and features, which can be used as additional supplies and accessories for laptops, iPhone, iPad, pens, keys, wallets, books, clothes, bottles, passports, etc. 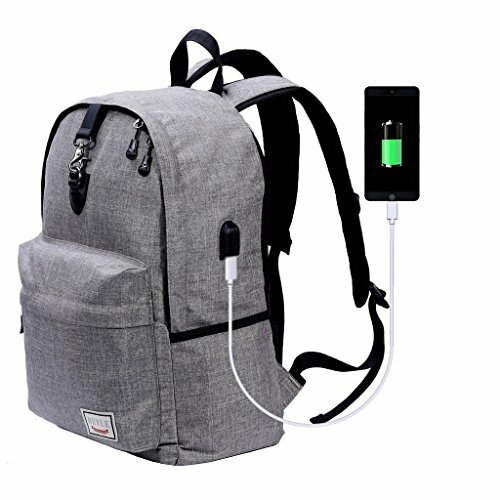 USB access: You can charge your phone, tablet and other devices easily and conveniently without opening up the backpack. Anti-Theft:The front and side buckles provide a good protection that prevent from unzipping the bag and stealing valuables. It is more convenient than coded lock. 100% SATISFACTION GUARANTEE: We offers 90 days 100% satisfaction guarantee. We are committed to providing our customers with high-quality and affordable products. If you have any question, Please do not hesitate to contact us. 100% SATISFACTION GUARANTEE: We offers 90 days 100% satisfaction guarantee. We are committed to providing our customers with high-quality and affordable products. If you have any question, Please do not hesitate to contact us. If you have any questions about this product by Beyle, contact us by completing and submitting the form below. If you are looking for a specif part number, please include it with your message.